Mike Mokongo: "This is the best period of a season"
Aurore de Vitre (NM1) landed 30-year old naturalized Central African point guard Michael Mokongo (180-86). He played most recently at JL Bourg Basket in the ProB. In 9 games he averaged 5.1ppg, 2.2rpg and 2.7apg last season. NM1 will be definitely a better match and he can see more playing time. Mokongo helped them to win the cup. The previous (14-15) season he played at Monaco (also in ProB) where in 15 games he had 9.8ppg, 2.7rpg and 3.9apg. Mokongo contributed to his team winning the ProB title (twice). He represented France at the Afrobasket Championships in Abidjan (Ivory Coast) three years ago. His stats at that event were 4 games: 12.5ppg, 2.5rpg, Assists-5 (5.0apg), 1.0spg, FGP: 40.0%, 3PT: 44.4%, FT: 77.8%. Mokongo is a very experienced player. He has played also professionally in Cyprus (Apoel), Italy (Betaland Cdo), Spain (Ourense, Leche Rio Breogan and Navarra), Turkey (Banvit) and France (Cholet Basket, Gravelines-Dunkerque, Chorale de Roanne and Chalon/Saor). Mokongo's game is described as: Very strong and quick, can defend full-court and can be very disruptive. Very good shooter who has improved play-making and leadership skills. Ready for the highest level of competition in Europe. We bring you last week's top performances from Central Africans who are playing abroad and who all have had prior experience of national team duties at youth or senior level. #1. 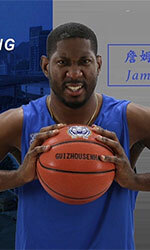 This week's number one is an experienced former international power forward James Mays (205-86, college: Clemson, currently plays in South Korea). He could not help one of league's weakest teams LG Sakers (30-24) in their last game. Despite Mays' very good performance LG Sakers lost 72-86 on the road to the second-ranked ET Land Elephants. He had a double-double by scoring 31 points and getting 18 rebounds. Mays also added and 4 steals in 36 minutes on the court. It was LG Sakers' first loss after four consecutive victories. Mays has individually a very good year with high stats. He averages: 26.6ppg, 14.6rpg, 2.0apg, 1.4spg, 2FGP: 53.1%, 3FGP: 25.2% and FT: 58.9% in 61 games he played so far. Mays is a naturalized American. He played for the Central African senior national team six years ago. Strangely Mays has never played in Central Africa. #2. Second place goes to an international power forward Johndre Jefferson (207-88, agency: Inception Sports, college: S.Carolina, currently plays in Greece). He was not able to help one of league's weakest teams one of league's weakest teams PAOK (16-4) in their last game on Sunday. Despite Jefferson's good performance PAOK was crushed 89-51 in Athens by the leading Panathinaikos. He was the top scorer with 11 points. Jefferson also added 6 rebounds. There are only four games left until the end of the Regular Season. So now every game will be critical. Jefferson's overall stats this season are: 8.6ppg, 5.0rpg, 2FGP: 63.6%(21-33) and FT: 81.8%. He is a naturalized American. Jefferson is in the roster of the Central African senior national team. Apparently he has never played in Central Africa. #3. The Central African player who performed third best last week abroad was an international power forward Jimmy Djimrabaye (202-92, currently plays in France). Djimrabaye was not able to secure a victory for Quimper UJAP (9-16) in their last game. Despite his very good performance Quimper UJAP was edged 90-87 in Bischwiller by the much higher-ranked (#7) Gries/Oberhoffen. Djimrabaye was the second best scorer with 17 points. He also added 4 rebounds and 2 blocks in 35 minutes. This year Djimrabaye's overall stats are: 7.9ppg, 3.8rpg, 1.3apg, 2FGP: 47.3%, 3FGP: 38.5% and FT: 81.5% in 25 games. He is also a member of the Central African senior national team. #4. Small forward Max Kouguere (198-87, currently plays in France) couldn't help Olympique Antibes (7-15) in their game against ASVEL Lyon-Villeurbanne Basket (10-11) in the French Jeep ELITE ProA. Kouguere's contribution was not very remarkable in Friday's game. He recorded only one point. Olympique Antibes was defeated 87-72 in Villeurbanne by the much higher-ranked ASVEL Lyon- Basket (#7). Kouguere's total stats this season are: 5.0ppg and 2.7rpg. He has a dual citizenship: Congolese and Central African. Kouguere is also Central African national team player. Notice: The list above includes only some of the Central African playing currently abroad. Go to Central African Abroad Page to see completed list. Traditionally, every week we bring you a list of the top performances of Central Africans who are currently playing abroad. #1. This week's number one is an international power forward Johndre Jefferson (207-88, agency: Inception Sports, college: S.Carolina, currently plays in Greece). 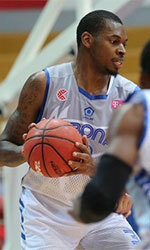 He led PAOK to a victory over the tenth-ranked Lavrio (6-15) 99-88 in the Greek A1 in Saturday night's game. Jefferson was MVP of the game. He scored 18 points, had 9 rebounds and made 2 blocks in 22 minutes on the court. PAOK Thessaloniki (15-4) is placed second in the A1. It was his team's fourth consecutive victory in a row. This year Jefferson averages: 8.2ppg, 4.8rpg, 2FGP: 64.3%(18-28) and FT: 86.7% in six games he played so far. He is a naturalized American. Jefferson is currently a member of the Central African senior national team. Strangely he has never played in Central Africa. #2. Second place goes to an experienced former international power forward James Mays (205-86, college: Clemson, currently plays in South Korea). Mays was the major contributor in a LG Sakers' victory against the closely-ranked KT Sonicboom (27-27) 88-84 in the South Korean KBL last Tuesday. He recorded a double-double by scoring 27 points and getting 13 rebounds. Mays also added 2 blocks. Changwon LG Sakers (30-24) are placed third in the KBL. It was his team's fourth consecutive victory in a row. It's Mays' first season with the team. He has individually a very good year with high stats. Mays averages: 26.7ppg, 14.8rpg, 1.9apg, 1.4spg, 2FGP: 53.2%, 3FGP: 25.0% and FT: 57.9%. He is a naturalized American. Mays played for the Central African national team in 2013. Apparently he has never played in Central Africa. #3. The Central African player who performed third best last week abroad was an international small forward Max Kouguere (198-87, currently plays in France). Kouguere could not help Olympique Antibes (6-15) to beat Provence Basket (8-16). It was not his best game last Friday. Kouguere scored only 2 points in 19 minutes. Olympique Antibes lost 72-76 on the road to the lower-ranked (#16) Provence Basket. It was Olympique Antibes' fourth consecutive loss in a row. This year Kouguere's overall stats are: 5.2ppg, 2.8rpg, 2FGP: 37.8%, 3FGP: 35.1% and FT: 56.5% in 24 games. He has a dual citizenship: Congolese and Central African. Kouguere is also a member of the Central African senior national team. #4. Power forward Jimmy Djimrabaye (202-92, currently plays in France) was not able to help Quimper UJAP in their game against ALM Evreux (10-14) in the French ProB (second division). He scored 9 points. But Quimper UJAP was defeated 85-78 in Evreux by the higher-ranked ALM Evreux (#12). They ended the series of three consecutive victories. Djimrabaye's total stats this season are: 7.5ppg, 3.8rpg and 1.3apg. He is also Central African national team player. Ivory Coast are a victory away from qualifying for the FIBA World Cup after beating Rwanda 87-60, while Central African Republic's bid was ended by Nigeria on Saturday. A win over Mali on Sunday will seal Ivory Coast's place in the tournament after they followed up a success over Nigeria with another triumph in Treichville. Vafessa Fofana (198-F/G-92) led the way with 21 points and Mohamed Deba Kone grabbed 10 rebounds as the Elephants stayed on course to progress. Central African Republic had to win to remain in the hunt, but went down 72-59 to Nigeria - who responded well to the end of their 12-match winning streak. Ikechukwu Diogu (204-F/C-83, college: Arizona St.) did much of the damage for Nigeria with 22 points as they improved to 10-1. Senegal were also winners in the African Qualifiers, seeing off Mali 62-38.